PCI DSS IT Security Policies & Standards - Affordable, editable & professionally-written IT security policies and standards based on ISO 27002.Customized, editable and easily implemented focused on PCI DSS v3.1 compliance. If your company needs information security policies and standards to comply with the Payment Card Industry Data Security Standard (PCI DSS), then we can be of service to you at a price you can afford. Our professional IT security team developed a comprehensive and affordable PCI DSS Cybersecurity Policy & Standards that is fully editable in Microsoft Word format, so that you can add any customization that you want to add. In addition to the PCI DSS Cybersecurity Policy & Standards, you get additional documentation that will help you implement it and ensure you stay compliant. It is well documented that the lack of standards and lack of employee awareness are the leading causes of security breaches, malware infections (e.g. viruses & spyware), and identity theft. If you accept credit and/or debit cards in any manner, our comprehensive PCI DSS Security Policy is just as important as the professional liability insurance you carry on your business. This PCI DSS Cybersecurity Policy & Standards document is authored by a certified PCI Professional (PCIP) and is entirely designed to help you become compliant with the PCI DSS v3.2. This comprehensive PCI DSS Cybersecurity Policy & Standards removes the time constraints and errors associated with trying to generate the documentation by yourself and our product is a fraction of the cost associated with hiring a consultant to write similar documentation for you. We offer an unparalleled product at an exceptional value! Product Example - PCI DSS Policy & Standards? Cost Savings Estimate - PCI DSS Policy & Standards? For your internal staff to generate comparable documentation, it would take them an estimated 160 internal staff work hours, which equates to a cost of approximately $12,000 in staff-related expenses. This is about 3-6 months of development time where your staff would be diverted from other work. If you hire a consultant to generate this documentation, it would take them an estimated 100 consultant work hours, which equates to a cost of approximately $30,000. This is about 2-3 months of development time for a contractor to provide you with the deliverable. The PCI DSS Policy & Standards is approximately 3% of the cost for a consultant or 7% of the cost of your internal staff to generate equivalent documentation. We process most orders the same business day so you can potentially start working with the PCI DSS Policy & Standards the same day you place your order. The PCI DSS Cybersecurity Policy & Standards can serve as a foundational element in your organization's cybersecurity program for PCI DSS compliance. It can stand alone or be paired with other specialized products we offer. In light of the recent credit card breaches at major retailers, it is likely that a crackdown will follow for businesses to follow better IT security. One of the most important points to remember when it comes to compliance is that if you cannot prove you are compliant (e.g., documented policies & standards) then your business will be unlikely to count on business insurance to cover the expense of a breach. Our PCI DSS Cybersecurity Policy & Standards contains the policies, standards, and documentation you need to comply with PCI DSS version 3.2. What Is The PCI DSS Policy & Standards? Complete coverage of all PCI DSS version 3.2 requirements - over 240 unique PCI DSS control requirements! 40+ pages of policies, standards & guidelines that provide you comprehensive PCI DSS v3.2 coverage. 60+ pages of supplemental documentation that saves hundreds of hours by not having to make it on your own. Just as Human Resources publishes an “employee handbook” to let employees know what is expected for employees from a HR perspective, the PCI DSS Cybersecurity Policy & Standards does this from a cybersecurity perspective. 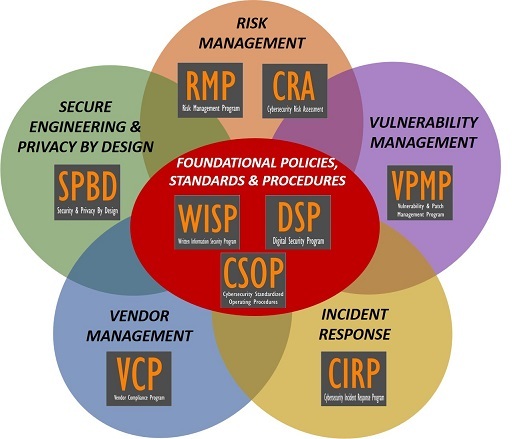 What Problem Does The PCI DSS Policy & Standards Solve? Lack of In House Security Experience - Writing security documentation is a skill that many good cybersecurity professionals simple are not proficient at and avoid the task at all cost. Tasking your security analysts and engineers to write comprehensive documentation means you are actively taking them away from protecting and defending your network, which is not a wise use of their time. The PCI DSS Cybersecurity Policy & Standards is an efficient method to obtain comprehensive security policies and standards for your organization! 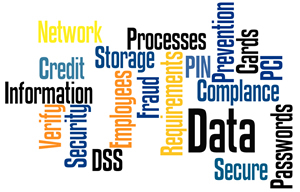 Compliance Requirements - PCI DSS is a requirement for most companies, regardless of industry. The PCI DSS Cybersecurity Policy & Standards is designed with compliance in mind, since it focuses on PCI DSS requirements. Audit Failures - Security documentation does not age gracefully like a fine wine. Outdated documentation leads to gaps that expose organizations to audit failures and system compromises. The PCI DSS Cybersecurity Policy & Standards shows you exactly what s required to both stay secure and compliant. Vendor Requirements - It is very common for clients and partners to request evidence of a security program and this includes policies and standards. The PCI DSS Cybersecurity Policy & Standards provides this evidence to cover the Cardholder Data Environment (CDE)! 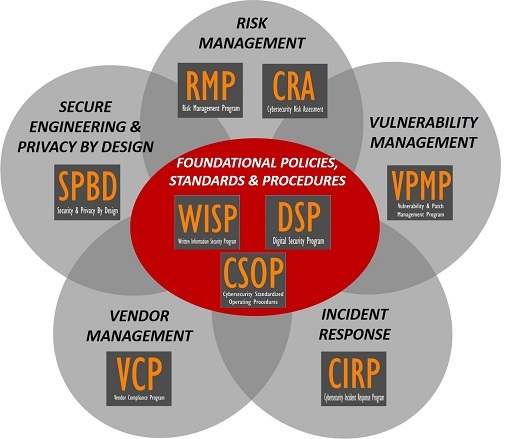 How Does The PCI DSS Policy & Standards Solve It? Clear Documentation - The PCI DSS Cybersecurity Policy & Standards provides the comprehensive documentation to prove that your PCI DSS security program exists. This equates to a time saving of hundreds of hours and tens of thousands of dollars in staff and consultant expenses! Time Savings - The PCI DSS Cybersecurity Policy & Standards can provide your organization with a semi-customized solution that requires minimal resources to fine tune for your organization's specific needs. 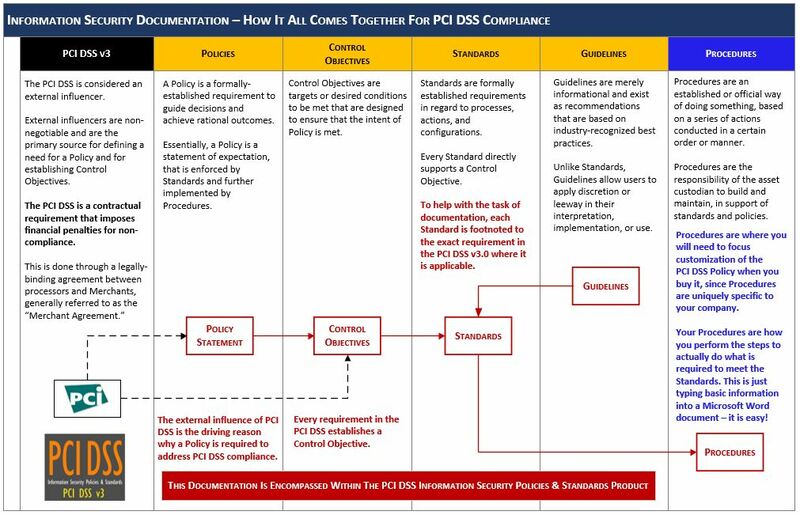 Alignment With Leading Practices - The PCI DSS Cybersecurity Policy & Standards is directly mapped to version 3.2 of the PCI DSS! This Is How PCI DSS Cybersecurity Documentation Is Meant To Be Structured! 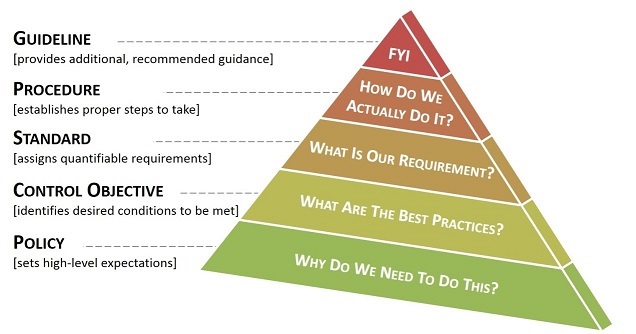 Do you have the documentation you need to prove compliance? In terms of liability for a company, information security does not exist until it is documented - if you cannot prove it, it does not exist! Since ignorance is neither bliss, nor is it an excuse, you need to be able to prove you followed due care & due diligence to protect your business - this is where Compliance Forge can help you with our information security policies. A rule of thumb when it comes to compliance is that if you are not absolutely sure you are compliant, then you are likely non-compliant. Having clearly written policies and standards takes a lot of the guesswork out of compliance so that you can focus on what you do best, which is growing your business! The primary reason to buy our comprehensive PCI DSS Cybersecurity Policy & Standards is pretty simple - having a written information security program in place is mandatory for all Merchants, regardless of their size (PCI DSS Requirement # 12). Our comprehensive PCI DSS Cybersecurity Policy & Standards removes the time constraints and errors associated with trying to generate the documentation by yourself and our product is a fraction of the cost associated with hiring a consultant to write similar documentation for you. We offer an unparalleled product at an exceptional value! Don't take our word for it - take a look at the example PCI DSS IT Security Policy to see for yourself to see the level of professionalism and detail that went into it. The PCI DSS is a requirement that applies to all Merchants, regardless of size of the company, how many transactions you process or what processor you use to process the transactions. You may have overlooked the fine print when you signed your Merchant agreement, but if you do accept credit or debit cards, you are legally bound to be compliant with the PCI DSS. This is why you should care about PCI DSS - It is arguably the most critical issue facing businesses in terms of liability. The business justification for purchasing a PCI DSS Cybersecurity Policy & Standards is quite straightforward - non-compliance with the PCI DSS is evidence of professional negligence and your business insurance will not cover your losses if you cannot prove that you were compliant with the PCI DSS at the time of an incident involving the loss of credit card data or fraudulent claims. Financially, this could mean tens of thousands of dollars in fees associated with card replacement costs and breach notification fees. Ignorance is neither bliss, nor is it an excuse!! Buy your PCI DSS Cybersecurity Policy & Standards today to protect your company by showing evidence of compliance with the PCI DSS. If your needs grow, you can upgrade to our Written Information Security Program (WISP), which is a more comprehensive document that is intended to address multiple compliance requirements, such as HIPAA, FACTA, GLBA, SOX, FISMA, in addition to PCI DSS. Our documentation is elegantly simple - you have alignment between the PCI DSS requirements, the policies, control objectives, standards and procedures. That is how IT security documentation is supposed to be written!